This verse has been my prayer for nearly forty years, but not always in its entirety. At first I was most focused on “I want to know Christ.” Really, truly know Him. Deeply, personally, intimately. I want His desires and His passions to become mine. I want to “know” Him so well that I will live and breathe Him with every step I take in this life. I can never know Jesus enough. There is so much to learn. I want to love Him more deeply and continue to grow in Him so that I will become more like Him in all my thoughts, words, and actions. So many things in life throw up roadblocks to getting closer to Him, but I need to press on. Through His power I can level them. Eventually my longing turned also towards the second part of this verse: “I want to know… the power of His resurrection.” To be imbued with that power of Christ that can rise from the dead, to be so enfused and fired up with Christ’s power in me that I will live for Him with all my heart, soul, strength, and mind. That I will live in and through Christ and His power with every fiber of my being. I cannot even imagine what would have happened if Christ had remained in the grave. My sins would have been buried with Him, but where would be the freedom? The joy in being released from the captivity of death? How I rejoice in the POWER of His resurrection! There are times when I pray that God will use whatever is necessary to make me more like Him, but then later I sometimes have to cry, “O God, I do want to know You more and be more like You, but now I’m almost sorry I asked… Does it really have to be through such a painful way?” Then again I have to lay my heart and my life down at His feet and sigh, “Yes, Lord, I am Your child, and I know that in order to be more like You, I must also know more what it is like to share in Your sufferings.” Then I scold myself for complaining, because God loves me so deeply and unconditionally and He will never allow anything to happen in my life that will not draw me into a more personal relationship with Him and nudge me more into living in and through the power of His resurrection. And no matter what kind of sufferings I go through in this life, it will never, ever be even a speck of what Jesus has suffered for me to free me from all my sins. What body, mind, and soul anguish He endured! Wow! Such incomprehensible love! So, ok, God, if I may learn to praise You more, to be more like Jesus, to live in and through Your power, then I will try more to pray also to know more of Your sufferings. Thank You so much for Your unselfish love and all-sufficient grace and unending compassion! Please bless those who read this. Bless them with the POWER of Your resurrection! Give them to know You more personally and intimately. And if it must happen through knowing more of what it is to suffer, then strengthen them to remember that the suffering we endure here will never compare to the glory You have in store for us. AMEN! 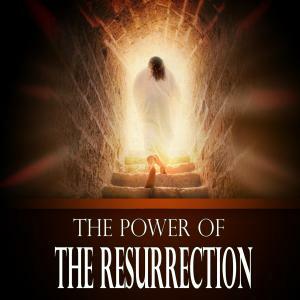 HAVE A POWERFULLY BLESSED EASTER! hello there i really love this post of the Risen christ coming of out the tomb. iam so passionate about my JESUS ,he is the only one i have and He understands me very well. show off my king coming out of the tomb with the resurrection power and beams of light. Thank you, Sarah Janee. I’m glad you’re passionate about our JESUS. 🙂 Yes, He understands us more than anyone on earth. You certainly are welcome to share this post with a reference back to this site, but I’m not certain what you mean by having a bigger post to share on your Facebook Timeline.